Are You Looking for an Extreme Weight Loss Plan? Fed up with the excess fat around your waist? Have you seen an old photo and realized how overweight you've become? Perhaps you’re aware of the issue, but you've been struggling with losing the weight? You’re not alone. When you need to lose 100+ pounds, it’s not surprising that you’re struggling to know where to start. You can find hope by developing an extreme weight loss plan. By taking the right steps, you’ll quickly realize that you can achieve the weight loss you dream of. An extreme weight loss plan, along with the support of others, will push you in the right direction. This guide will take you through the key elements of any weight loss plan. The FF30X is a program created by the Fit Father Project to help older men lose weight and improve their health. The project already has thousands of members who have successfully achieved their goals and are ready to inspire and support you on your own journey. If you’re not a ‘people person’ you can simply access the information, it will help you to stay on track and lose the weight. In many cases, people are inspired to lose weight because of an upcoming event or even a specific photo. I never forget the horror I felt when I saw my photo from the Christmas party; I knew I needed to lose weight even though I thought I was in shape. Fortunately, whether you’re hoping to lose 10 pounds or over 100, the principles are the same, and the FF30X can help you to achieve your goal. Over the years Brian put on the pounds until he weighed 350 pounds. He spent 20 years trying different programs and tactics to lose weight, but it was only after he found the FF30X that his weight loss goals were realized. He used an extreme weight loss plan to drop 109 pounds. The hard work didn't just improve his looks; now he no longer needs his medications! This is another of the Fit Father Project success stories. Craig found the Fit Father Project in May of 2017 when he weighed 306 pounds. In just 6 months he dropped 109 pounds to transform his body and his life. In fact, he ran his first 5k and finished it just 6 months after starting to lose the weight. His journey into weight gain started at school but has had plenty of ups and downs along the way. He can even deal with the holiday season knowing that he’ll return to exercising and eating healthily straight after. Although Craig isn't sure of exactly what triggered the change of his mindset from simply accepting he was fat, he is definitely glad he tried the FF30X and is continuing to lose weight on the plan! There are actors that will happily gain and lose weight for specific roles, but this is not always the case. Actor Jonah Hill has always seen himself as a larger person. Jonah says this stems from being larger at school. The idea that he was fat has been affirmed by a countless number of people over the years. Fortunately, Hill realized that he didn't have to stay this way. After speaking to a number of experts, he started adding exercise to his daily routine and looked at his nutrition. For Hill sushi has become a key part of his new diet. Sushi is low in calories and has plenty of omega-3 fatty acids that are beneficial to your body. Now he’s a much slimmer version of the man he was and a lot healthier too. At his heaviest John Goodman weighed in excess of 400 pounds. 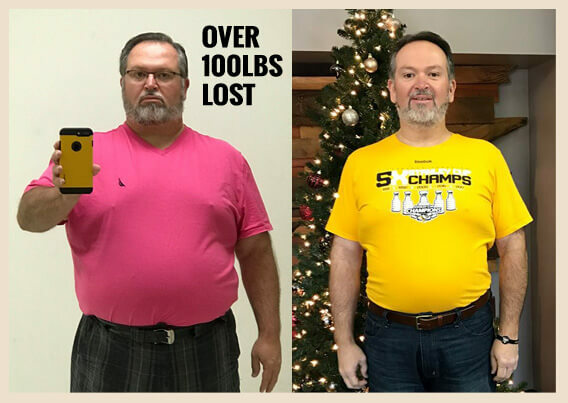 Since starting to tackle his weight problem, he has lost in excess of 100 pounds, putting him in an elite club alongside Fit Father members Brian and Craig above. Goodman believes he had issues with his own self-worth for years; it is only recently that he has been able to look back and appreciate all that he has achieved. This sparked him to start losing the weight by simply using portion control. Controlling what you eat via a simple principle such as the perfect plate will help to ensure you don’t overeat and learn to say no. The result is fewer calories coming in than your maintenance calories allowing you to successfully lose weight and keep it off. To find your own extreme weight loss plan and make it work you need to consider the following essential elements. However, it is important not to attempt to change everything at the same time; you should see these as steps that need to be followed. There is no time limit regarding when you should move onto the next step, let your body and state of mind guide you and you will move through all these steps and start seeing the results of your hard work. We've already looked at the event that first triggers your desire to lose weight. Because you see yourself every day, it is easy to overlook the small changes that happen, leading to a large change overall. However, once you've discovered the motivation to lose weight you need to build a habit, which will help when your motivation is failing. You also need to commit to your weight loss. The easiest way to do this is to remove all the foods that are wrong for you and will no longer be part of your life. You should also book time on your own calendar for exercising. Simply having the time booked will make it harder to avoid doing it. It is also important to set your goals. If you currently weight over 300 pounds, you may want to set a 100-pound loss limit, or you may simply have a target weight in mind. Either is acceptable, but setting that a goal will make it easier to monitor progress. It may be best to break your goal down into smaller goals. Select your weight loss amount and then how long you would like to take, which will give you the amount of weight you need to lose per week. The idea amount to aim for is 2 – 3 pounds per week, as this is generally sustainable. By having a weekly goal which you can reach, you’ll feel inspired to keep going, and you’ll reach your overall goal almost without realizing! You need food to provide energy and other important nutrients. However, there is a big difference in the quality of the food you put into your body and the effect it has. In order to lose weight, you simply need to eat fewer calories than your body needs to function. (That’s the maintenance calories mentioned earlier). But, this doesn't mean a trip to the store to pick up any food labeled low calorie or low fat. You need to consume natural foods and avoid processed sugars in order to feel full while reducing your calorie intake. Remember every meal should be a good balance of vegetables, proteins, and carbohydrates. The perfect plate approach advocates ½ plate vegetables, ¼ plate protein, and ¼ plate carbs. It’s a great way to lose weight and keep it off. Once you understand which foods you should be eating the next step is to refine your portion control. There is little point in eating low-calorie foods if you simply eat more of them, effectively increasing your calorific intake. The perfect plate is a great approach, especially if you combine this with a smaller plate. You will then be able to limit your food intake through portion control. This is actually relatively easy. The real trick is having the willpower to avoid second or third helpings and not snacking. That’s when you need the support of the FF30X program. The problem with most diets is that you can lose weight quickly, but the diet is very difficult to stick to in the long term, and the result is likely to be weight gain after you finish the diet. That’s why you need to adopt a sustainable approach by changing your attitudes to food and the way you eat. Both portion control and the perfect plate will allow you to continue eating almost any food. However, you’ll notice over time that your food preferences and decisions will change for the better, this is a sustainable way of life. Anything that is too radical a change is not likely to be sustainable and should be avoided. When you’re looking to undertake an extreme weight loss plan, you need to consider starting some exercise. Although what you eat is the most important part of weight loss exercise will increase the number of calories you burn and improve the health of your body. In order to boost your metabolism and get the best possible results, you should adopt the short burst method. A recent study has shown that short bursts of exercise are just as beneficial as longer workouts. They will also place less stress on your body, and it is easier to find 3 ten minute slots each day instead of one 30 minute slot. If you haven’t exercised in a while then you can start with something as simple as a short walk, anything that gets you moving is beneficial. You’ll quickly build a habit of exercising and want to progress to more complex things such as jogging, cycling, swimming or even some resistance training. You probably already realize that sugar has to go. Of course, you need a little to keep your body healthy, but you don’t need all the products with added sugar such as fizzy drinks, candy, pastries, and donuts or even dairy desserts. In addition, you should start to consider the types of carbs you are eating, such as those in white bread, white rice, white flour, and candy. These are quickly broken down in your body and are great for an energy boost. However, too many of them equate to overloading your system and encourages fat storage, which is not the result you are looking for. You may take water for granted but drinking at least 2.5 liters throughout the day will help you to feel full. This will help you to resist snacking temptations and overeating at meal times. Water is also excellent for hydrating your cells helping them to work more efficiently. It is possible to purchase an array of supplements that promise to boost weight loss. However, it is important to be extremely careful if you decide to take any of these. Some of them will give you unpleasant side effects including bloating, diarrhea and even headaches. It is much better to supplement your body naturally. If you have adopted portion control and the perfect plate, then you should be getting the right level of nutrients for your body. There are tons of nutrients and vitamins available to help you feel yourself and make the right decisions. Check out this article regarding healthy energy supplements to give you a bit of an edge to your efforts. This is known as a thermogenic compound. In effect, it raises your core body temperature, in turn, your body needs to burn more energy in order to lower your body temperature back to normal. Burning extra energy means you’re using more calories. By producing a calorie deficit, you'll be burning more fat. Caffeine is known to be a stimulant, one of the reasons you shouldn't drink it too close to bedtime. However, drinking it during the day will increase your metabolic rate which boosts calorie and fat burning abilities. In addition, it can help to give you more energy when you’re exercising, allowing you to push yourself harder and for longer. Are You Ready To Start Your Extreme Weight Loss Plan? There is nothing stopping you from starting your own extreme weight loss plan today. Transform your body into the what you want it to be. For a better chance of success, join FF30X today. This will give you the support and information you need, as well as the opportunity to share and show off about your own loss. You can actually be someone else’s inspiration! Try FF30X today if you literally have pounds to lose! *Please know that weight loss results & health changes/improvements vary from individual to individual; you may not achieve similar results. Always consult with your doctor before making health decisions. This is not medical advice – simply very well-researched info on extreme weight loss.